View models manufactured by Automodello. Our library is a reference of models produced by this manufacturer. 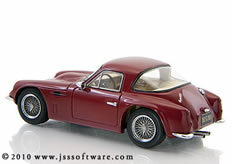 Automodello is the brainchild of Jim Cowen, British sports car enthusiast and proprietor of online diecast retailer Diecasm LLC. In the course of operating Diecasm, Jim began to take note of important and interesting cars that were being overlooked by the mainstream diecast manufacturers. Not content to let these models remain neglected, Jim enlisted master designer Raffi Minasian to craft the prototypes for this exciting new line. * Diecasm offers a payment plan for Automodello 1:24th models.